One big advantage of metal roofing systems over flat or single ply is their longer lifespans. In fact it’s more than twice the average lifespan of these other options – a commercial metal roofing system can last as long as 40 years or more. Another big plus is the fact that they require less maintenance over their lifespans also. One thing to remember – metal roofing contracts and expands more than other types of systems, which will put pressure on flashing, seams and fasteners. This will create some separation of these components over the years and moisture will leak into areas below. If you aren’t on top of this, it will put you in a position where you will need to replace the roof. Replacement is a big expense, so most property owners will look into repairs until the company budget and time fits to schedule the replacement. The very best thing you can do to increase the useful life of your roof is to institute and follow a routine roof maintenance plan. In order to help our customers find the minor repairs that can be made to help avoid an eventual replacement, we have yearly maintenance inspection so you can make informed decisions. There are roofing systems that are less expensive to install than metal for your building, but when you factor in the increased repairs, maintenance and shorter life expectancy of flat roofing, the advantages of metal is obvious. You can cut out the middle man ad save a great deal of money by roll forming the panels on the job site instead of ordering them from the factory. This comes into play especially if you have a large industrial or commercial building. The panels can be cut to precise lengths and placed together without any horizontal lap joints, giving you even greater control over the process. Research has shown that more than half of the more recently built commercial buildings in the country are now made up of metal systems. This has created a big future market for commercial metal roof restoration and repair. All of this means choosing a metal roof for your industrial or commercial building is a wise decision. Before a roofing repair issue blows up into a full replacement, routine maintenance schedules are put in place to find issues early and extending the roof’s life expectancy. The most common issue thats found, of course, is leaking water. Poor installation processes are the main culprit for leaking issues. One major factor that contributes to leaking is how the roof penetrations are protected from the elements in a proper fashion. Locating these issues and repairing them is a simple process for someone who knows what to look for. 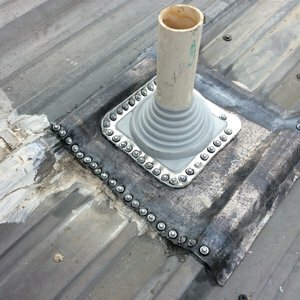 There are 4 main installation problems that cause most leaks with commercial metal roofing systems. Your commercial roofing contractor’s job is to make you aware of any of these common issues that may be showing up on your roof. Screw heads that have improper tape sealant underneath them. Poor caulking underneath the roof panels and trim. Panel laps and eves that have improper sealant installed. Screw heads that have improper tape sealant installed underneath. Using the right type of specialized equipment will show whether the proper sealants are in place throughout the roof. These tight spaces and dimensions can be checked by this tool, which is designed to fit in them. If for some reason the sealants weren’t initially installed properly, or not at all, the panels will need to be taken off and reinstalled. Improper installation doesn’t cause all issues, however. The design process of the roof itself is sometimes the culprit. Here’s an example – if you have trapezoidal seams and the closure strips at the eves are poorly designed, you could have a problem keeping them watertight. Also, if end closures at drains and gutters are improperly designed and implemented, they’ll overflow and leak. Even if the end closures are appropriate and installed properly, you could still have leaks if the wrong sealant is used. If these areas are watertight, there are other areas of your commercial metal roof that need to be inspected. Another area where leaks are often found on metal roofing is at open penetrations and seams. Some other areas that are critical to check are any intersections with some other type of material – masonry or ridge vents as an example – as they are common areas for leaking. Here at Taurus Elite Commercial Roof Systems, 512-332-4422, we provide commercial roofing services to Austin, Texas and the surrounding communities. This includes commercial metal roof repair, commercial metal roof restoration and commercial metal roof installation. We have been providing professional commercial roofing services to the area for years. When you need your commercial metal roof inspected or repaired by a company you can trust, give us a call.